I’ve used Poll Everywhere a couple of times, both as an experiment to see how well it works and also, most recently, to try to make a point. In addition to yesterday’s post titled Things I Don’t Believe (see slides 2 & 3), I also used Poll Everywhere with the poll embedded in a PowerPoint slide. I was using the Turning Point clickers with the audience of about 315 educators when about halfway through the presentation I asked how many of them had cell phones. At least 250 hands went up in the auditorium. I asked them to take out their cell phones if they had a text messaging service with their phone. Then the poll question appeared on the screen. 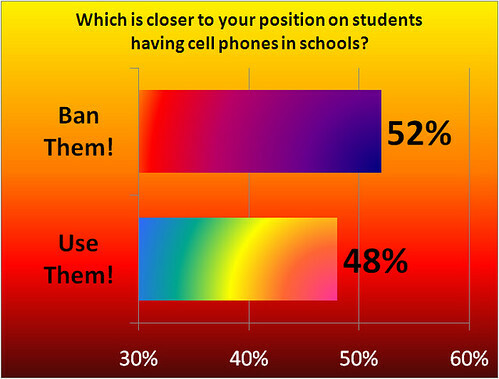 Q: Which is closer to your position on students having cell phones in schools? A1: Ban them! They are a complete distraction and detract from learning. A2: Use them! They are powerful devices that can be used for learning. Suffice it to say that I found the irony quite enjoyable. Teachers using their cell phones to answer a poll question saying that cell phones should not be allowed in school. I was using the free version of Poll Everywhere so this is actually a very small subset (23 responses) of the people in the room. I was surprised by the nearly equal division of the responses as I expected a higher percentage to say Ban Them! I erred in not getting all of them to respond to the question using the other clickers. Now I really want to know what all 315 of them think about this question. 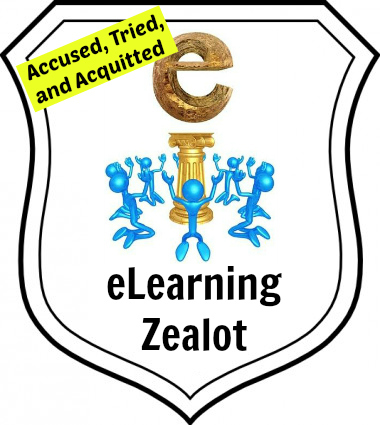 During a recent presentation with a K-12 audience, I went through a bit of a rant (softer than most) about things that I don’t believe regarding the uses of technology in the K-12 system. My point of view was more as a parent of three children in the K-12 system, and less about my role as a Chief Technology Officer in higher education. 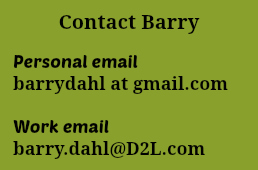 This slide show has plenty of text to illustrate the points I wanted to make. This short little slide show is taken from a longer piece I did with about 320 K-12 teachers and administrators. They were using clickers to answer various questions about technology uses. This fun little segment was part of the icebreaking piece before we got down to more serious business. I’m not trying to make fun of anyone here (although I take a well deserved shot at one of the famous quote-makers) by showing how many people believe things that aren’t true, but I am a bit amazed how easy it is to get people to believe things happened when they clearly did not. If enough people say something is true, does that make it true? Umh, no. Filed under: Uncategorized | Tagged: Bush, Gore, Quotes, Washington |	Comments Off on Famous Quotes? Or Not? I will be returning to Saigon again in about three weeks. I’m already looking forward to the fabulous fresh fruits such as the pitaya, watching the early risers engaging in group exercise in the park, seeing my friends in the Vietnamese Association of Community Colleges, and dodging my way through the crazy hustle and bustle of the bikes, scooters, cars, and trucks on each and every road. However, I am so sad to say that I can no longer look forward to once again seeing my friend, Bill from Saigon. Bill passed away on either August 25 or 26 during his sleep. The best information I have been able to find indicates that he had been sick with pneumonia and he just became too weak and died. He was cremated a short time after. I had been planning to see Bill again when I returned. He was always such fun to talk to. A very kind and gentle man. 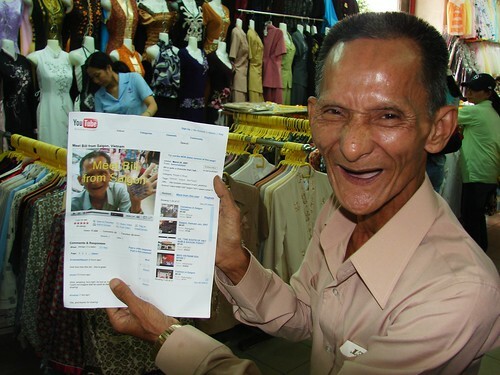 I started talking to him one day in March 2007 in the crazy Ben Thanh market where he sold postcards almost every day. I was so taken with him that first time that I shot some video of him with a cheesy little digital camera that I had with me that day. The video quality isn’t great, but that video turned Bill into something of a folk hero in his own country. It was re-posted on several dozen Vietnamese blogs and websites and has been viewed almost 160,000 times on YouTube (now over 625,000 times as of 2/26/13). When I visited him again in early October 2007 he was shocked to find that he was becoming famous throughout his country because of the video that I shot of him. He was shocked, but also very proud that his fellow Vietnamese thought so highly of him, especially the young people. On that trip in October I made a new friend in Vietnam. Her name is Chau and she is a student in Singapore and has also recently studied in the U.S. in Oklahoma City. Chau is a very intelligent and engaging young person. She was so taken by Bill’s video that she too wanted to meet him. She took that meeting and turned it into a news article about Bill. That article was published in both Vietnamese and in English by one of the local newspapers in Saigon. She also took the top photo in this post of me and Bill. Bill’s real name was Tran Son Hung. The first video I shot of him explains how he came to be known as Bill and how he learned English and developed an American accent by watching American movies. After the first video was posted (I later published three more video responses from footage taken in October) he was visited by many people from all over the world who had seen his video and wanted to meet Bill from Saigon, or just Bill Saigon as some of them called him. He would proudly show the printout from YouTube as shown above. A couple of other people have also posted videos of their meetings with Bill in the marketplace. This post really doesn’t do justice to the quality of person that Bill was. I miss him greatly even though we only spent a little more than an hour together during my two visits with him. Bill’s signature saying was a (slightly altered) quote from Helen Keller: “The best and most beautiful things in the world cannot be seen nor touched, but are felt in the heart.” Then he’d end that with a hearty “G’day mate!” since he had many Australian friends who would visit him. Bill was the best, and he touched my heart. Rest in peace my hero on the mountain.